Deicide, the grand-daddies of death metal controversy, are heading back out on the road with Septicflesh, Abysmal Dawn, Carach Angren, and no strangers to backlash themselves, Inquisition. The tour heads out in the beginning of October and will drop in to cities such as Chicago, Seattle, and Austin. On October 9, they’ll swing in to NYC’s Gramercy Theatre. Tickets will be on sale soon via Ticketmaster. The complete list of dates appears below. 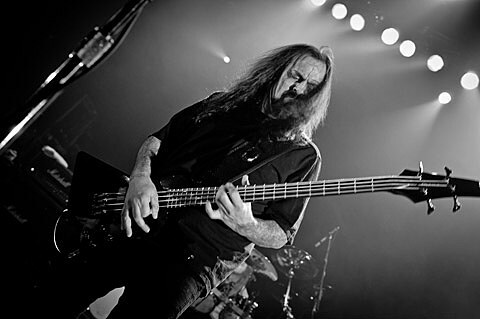 Deicide released album number 11, In the Minds of Evil, in 2013. (They also boarded the friendship roller coaster with Broken Hope.) In the early ’90s, bassist/double-tracked screamer Glen Benton was a lighting rod due to his alleged satanism and, of course, the upside-down cross burnt into his forehead. Black metallers Inquisition are still licking their wounds after getting called out for racism earlier in the year. The other acts have a clearer conscience: The Lovecraftian Septicflesh’s only point of contention is their glossy production. They released Titan back in June. Relapse’s ripping death metallers Abysmal Dawn will drop Obsolescence at the end of October. And Dutch symphonic black metallers Carach Angren cut the acclaimed Where the Corpses Sink Forever back in 2012.